Cameron Biedscheid is transferring from Notre Dame, and he could wind up at Mizzou after spurning the Tigers initially. Cameron Biedscheid spurned the Missouri Tigers’ basketball program when he committed to and signed with Notre Dame while at Cardinal Ritter College Prep in St. Louis. But Biedscheid, a 6-foot-7, 186-pound sophomore small forward, is now transferring from Notre Dame, and a source close to him said he could end up at Mizzou after all. He is expected to decide quickly on his next destination — Saint Louis University also is expected to be considered — so he can enroll for the next semester. Biedscheid, who was sitting out this season at Notre Dame as a redshirt, was a highly regarded recruit coming out of Cardinal Ritter, where he averaged 31.7 points and 9.6 rebounds as a senior and was selected the Gatorade Player of the Year in Missouri as well as the St. Louis Post-Dispatch player of the year. The high-scoring wing forward was rated as the 28th-best prospect nationally in the Class of 2012 by Rivals.com and the No. 49 prospect nationally by Scout.com. 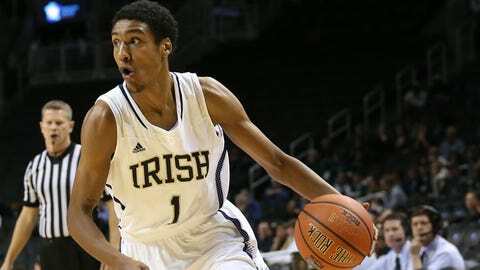 Biedscheid played in 34 games for Notre Dame as a freshman a year ago and averaged 6.2 points and 1.4 rebounds in 17.4 minutes per game. He shot 30.3 percent from beyond the 3-point line (36 of 119) and 81.8 percent on free throws (36 of 44). As a high school player at Gateway Tech in St. Louis, Sheldon Richardson showed he could do just about everything on a football field. He starred for the Jaguars as a defensive end and tight end. He wreaked havoc on opposing quarterbacks. He caught passes. He ran the ball. He scored touchdowns. He even returned kicks. Richardson, who played two seasons at Mizzou after transferring from junior college, has proven to be a versatile player in his rookie season with the New York Jets. The first-round draft pick started 15 of 16 games for Rex Ryan’s squad and established himself as a Defensive Rookie of the Year candidate after racking up 77 tackles, 3 1/2 sacks and a forced fumble. "I don’t care, I am that," Richardson told reporters Sunday when asked about the possibility of being the Defensive Rookie of the Year. "Even if I don’t win it, I am that. You can’t tell me anything different." Richardson capped off his rookie season by scoring his second rushing touchdown in the Jets’ 20-7 win Sunday. The two scores tied William "The Refrigerator" Perry for the most touchdowns in a season by a defensive lineman. Perry scored twice in 1985. "I’ve been scoring touchdowns since I’ve been in high school," Richardson said. "That’s why I don’t celebrate." Missouri assistant coach Craig Kuligowski has been named a finalist for FootballScoop.com’s Defensive Line Coach of the Year. Coach "Kool" is in his 13th season at Mizzou after previously coaching from 1992-2000 at Toledo under Gary Pinkel. Kuligowski was an offensive lineman at Toledo from 1987-1990. Kuligowski, who has one of the best Twitter handles going in "@LetsMeetAtTheQB," deserves recognition for his work with the Tigers throughout the years, which includes the development of such NFL first-round draft picks as Ziggy Hood, Aldon Smith and Richardson. Missouri’s defensive line, led by unanimous All-America end Michael Sam, was one of the best in the country this season. "Coach Kool has done a tremendous job," said Pinkel, who has now coached with him for 22 years. "He’s done a great, great job. It’s pretty awesome." 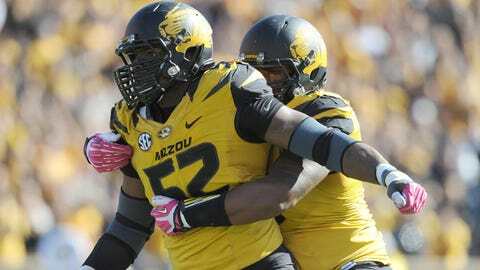 Missouri’s defensive line recorded 35 of the Tigers’ SEC-leading 38 sacks this season. Sam led Mizzou with 10 1/2, and Kony Ealy had 7 1/2, Markus Golden had 6 1/2 and Shane Ray had 4 1/2. "I think Coach Kool is a special kind of defensive line coach," Ealy said. "You can be talented anywhere. You can be as talented as you want, but if you don’t have the right mindset, the right structure and the right coaching, it’s not going to matter to two red nickels rubbing together. I think Coach Kool brings a lot to the table when he takes talent and he puts a lot into it and they produce on the field. It shows on the field. What he teaches us is exactly what we’re doing on the field." The Kansas City Chiefs sat several starters Sunday against the San Diego Chargers, giving former Mizzou standout Chase Daniel the opportunity to make his first NFL start. Daniel, who signed a three-year contract last off-season to be the Chiefs’ backup, performed well in Kansas City’s 27-24 overtime loss. He completed 21 of 30 passes for 200 yards and one touchdown. His passer rating was 99.3. He also ran for 59 yards on seven carries. "Personally, for me it was good to play a little bit and it was good to get those guys some reps, because down the road a non-healthy team is going to win the Super Bowl," Daniel said. "You don’t know when your number is going to be called, so for guys to get playing time like they did today in a game that the Chargers absolutely needed and for them to step up to play the way they did, I couldn’t be more proud." In his career as the backup for the Saints (2009-2012) and Chiefs before Sunday, Daniel had completed 11 of 17 passes for 103 yards and one interception and had a career passer rating of 56.7. "He battled and made a lot of really good plays," Chargers quarterback Philip Rivers said. "I know he plays during the preseason, but I don’t know how many regular-season plays he’s had, so I thought he did a heck of a job." The SEC announced Monday morning that Missouri junior guard Jordan Clarkson was the conference’s Player of the Week for the third time this season. Clarkson has led the Tigers to an 11-1 start, including a 68-65 road win at North Carolina State on Saturday. He scored 11 of his 21 points over the final 8:29 to help Missouri secure the win. Clarkson, a 6-5 transfer from Tulsa, is leading the SEC in scoring at 20 points per game. He is averaging a team-high 4.3 assists per game. The Tigers return to action Saturday, when they host Long Beach State (4-9) at 4 p.m. at Mizzou Arena. It will be the final non-conference contest of the season.